Bill Gates & Microsoft In 1975, before graduation Gates left Harvard to form Microsoft with his childhood friend Paul Allen. The pair planned to develop software for the newly emerging personal computer market. Bill Gate's company Microsoft became famous for their computer operating systems and killer business deals. For example, Bill Gates talked IBM into letting Microsoft retain the licensing rights to MS-DOS an operating system, that IBM needed for their new personal computer. 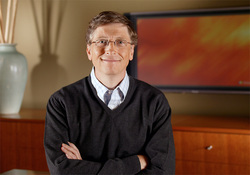 Gates proceeded to make a fortune from the licensing of MS-DOS. On November 10, 1983, at the Plaza Hotel in New York City, Microsoft Corporation formally announced Microsoft Windows, a next-generation operating system.